– Purchase 20 units of BOTOX® and receive a free chemical peel. Peel will be suited for your skin type and needs ($100 value). – For every syringe of JUVÉDERM® purchased receive 10 free units of BOTOX. – For every syringe of JUVÉDERM VOLUMA® purchased receive 15 free units of BOTOX. – Laser Pearl – Receive 2 treatments for $1,200 (savings of $300). – Laser Limelight Package – $1,200 (savings of $300). 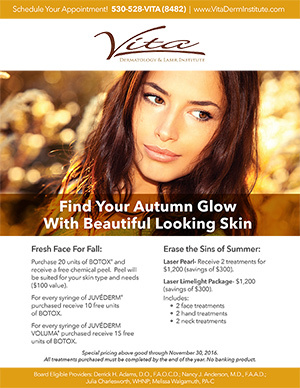 Visit the Vita Dermatology Blog for more information.